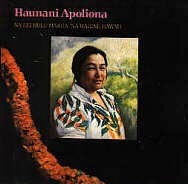 The debut solo album of Haunani Apoliona, Na Lei Hulu Makua, Na Wahine Hawai'i, is a loving tribute to the dignity and contributions of Hawaiian women. Classic Hawaiian compositions and new songs are delivered with ki ho'alu- Hawaiian slack key guitar- Apoliona style. This album Received six Na Hoku Hanohano awards from the Hawai'i Academy of Recording Arts.